Kristin Fahy is a fine runner but she isn't one who will try to shatter records all by herself. If she has some competition, bring it and the records on. 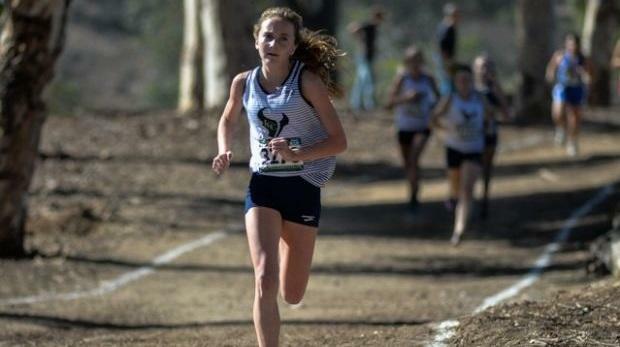 The La Costa Canyon senior led straight out of the chute and never was threatened en route to being the only girl to crack the 15-minute barrier at 14:59.1, winning the 2.75-mile Mt. Carmel/ASAICS Invitational on Saturday at Balboa Park by 34 seconds over Canyon Crest junior Carlie Dorostkar. It was a third straight title for Fahy who said she didn't spent any energy worrying about the clock. "I could care less about my time," said Fahy, the senior who clocked a 14:40 two years ago when pushed before running 15:05 in the heat of the day last year. It was overcast and in the low 70s at the start of the race-perfect running weather. "The important thing for me was to feel like myself. It felt good not to be scared to take the lead because since this was my first race, I didn't know where I was. Now I do and every race this year will be bigger and bigger." That starts with the Stanford Invitational next week where she will combine competition with a visit to the university, and then the always-tough Mt. SAC Invitational after that. "Getting under 15 was good," said Fahy who did not run last week while visiting Georgetown. "It was fun to have supporters-San Diego runners are so supportive. There were just many cheers, people telling me how far ahead I was and things. "I just had to push myself and when I ran down in the dog loop I felt kind of lonely." Dorostkar, who lowered her best time by 32 seconds, said she would like to have stayed a little closer to Fahy but didn't want to burn herself out, being content to battle Temecula Chaparral's Cynthia Martin (15:45.3) and LCC's Jessica Riedman (15:57.5). "I should have gone faster at the start to push Kristin more," said Dorostkar. "She's a competitor and a friend. I was just trying to stay smooth. The team dynamics are really important to me. "I just want to close the gap on Kristin and help my team since I'm the only one who returned from last year." Martin's team prevailed in this one, low-scoring Los Alamitos 76-77 with Canyon Crest right there with 79. Elsewhere, there were two impressive races in the class divisions. Mission Vista sophomore Bella Longo won her race by 77 seconds, clocking a 15:55.2-a time that would have finished fourth in the senior/invitational race. In the freshman girls race, Rancho Bernardo's Jacey Farmer clocked a 16:17.0-a time that was 27th all-time for 9th-graders.